Lots of big names at this meet. I went to watch last year. It was a good meet at a great facility. Check out the almost brand new facility in the WI fieldhouses thread. Not sure if it is accurate but Rzentkowski looks to be tripling while Bosley appears to be doubling. No way that Bosley escapes this meet without a loss or two if doubling. 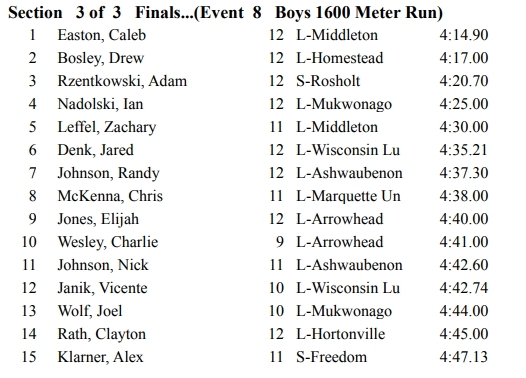 The 1600 will definitely take sub-4:20 to win and Rzentkowski and Easton have some credibility to their names already. I pick Bosley third in this event. I could see the 800 going in 1:55-1:56 but in this event Bosley is the surprising favorite. Still, that said, looking at the physical stature of Rzentkowski – and we’ll see him stand next to boy Bosley – it is really difficult to count against him in this race. 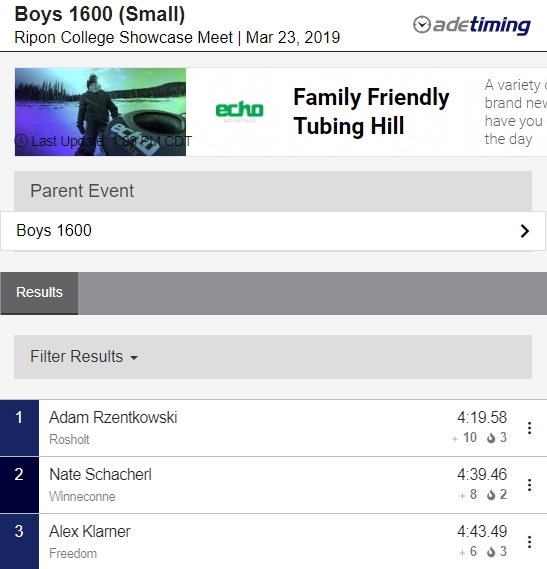 No reason for Rzentkowski going for the 3200 win as well after a tough double but who knows, he might need three indoor marks for a college coach. Bosley did the 1600-800 double last year. I seem to remember him hammering the field in the 1600 but just going for the win in the 800. I remember Rosholt being there last year but not sure what Rzentowski ran. Don’t believe Middleton was there last year. The facility is amazing! Didn’t Bosley almost have to hammer to re-instate himself as a dominant runner after an upset at Lake Michigan against Ansel Fellman? This year he would most optimally be coming in as “out of shape” as one could be after competing in Scotland. I was impressed with Rzentkowski posting a 4:22 first meet out. I think it means he is definitely ready to go faster. I have always been a fan of Caleb Easton. Last year he was somewhat under the radar until state. This year is different considering he has run 9:08. His progression in the 1600 has gone from 4:28-4:20-4:12. Not sure if he is capable of 4:04 but is definitely a worthy candidate for 4:08. Hope we can see him rip and run this weekend! Can this race go under 4:16? Rzentkowski ran the 3200 last year. Bosley won the 8 in 2:00. I doubt that gets the job done this year. The top two 4:14.16-4:16.80 is a phenomenal early showing for NAU recruits Bosley and Easton. Leffel could get to 4:15 by outdoors and potentially be a podium contender at this rate. Really surprised no Rzentkowski sighting in this race as they won’t really see him again. I see it now. Must have been an exciting race! Great to see Michael madoch back in form with his third place 800 meters in 1:59.3. Bosley showing he is a clear sub 1:53 half miler if he chooses to be (training wise and racing wise) with his 1:56.8, after a very hard mile. I wonder if Rzentkowski will run the 3200 too? 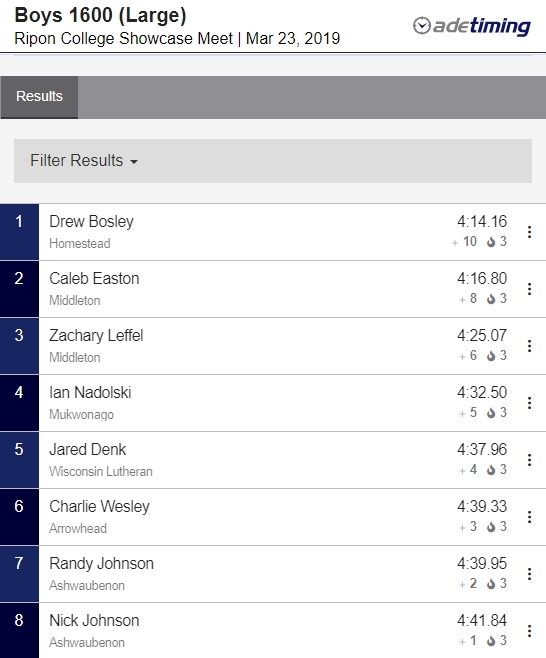 I did see the Rosholt 4x800 went 8:15, I wonder if that was without him? 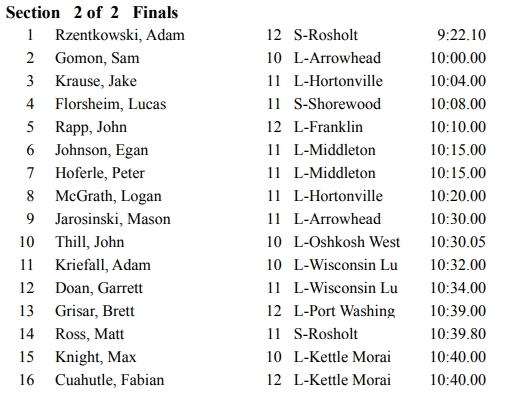 I noticed in the heat sheets that Lucas Florsheim has a 10:08 to his name but it is from that Whitefish Bay indoor track. I bet he goes in the 9:40s today. @zen wow I didn’t see that 4x800 but if rzentkowski ran that before the 4:19 and 1:59 what a beast. I don’t agree with that decision by their coach to do that to him however. That is a real fast time to open the season 8:15 hard to believe they could do that without him. Rosholt was listed as 10:22 for the 4x8. Another MIA runner is Jack Scherer. Devries might be out but he is not injured. Thanks! Yesterday they were definitely showing Rosholt as the winner in 8:15. Changed now of course. I was a bad parent yesterday and missed the track meet at Ripon. It was the first time in 18 years that I didn’t go to a meet because I didn’t feel like it. My son actually initiated the discussion - “I’m just running a leg in the 4X800” “It’s indoor” - why drive 2 hours for that? Well I missed some great races while watching the NCAA on TV. The Mukwonago kids were treated to Pizza Ranch having won the large school team title. They also won at Nelson Daniels last week. I didn’t know that - but if you do know Mukwonago they are about the “team thing”. Not saying that is a bad thing. 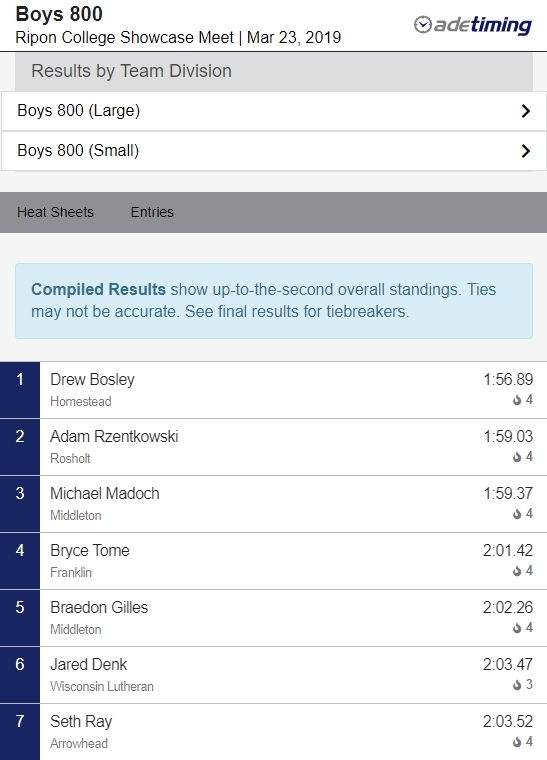 This site does lean distance running, but someone like Mukharrier might already know that Mukwonago wins these types of events with an" unknown" workhorse.I believe this kid has scored more points than any other Mukwonago track athlete in the school’s history. Last year he missed going to state - there was chatter that the program “ran him into to the ground” trying to score points at meets. I think this kid could have been a top tier 400M-type runner - but we will never know. I’m sure that many teams have had this type of athlete. Again, I think Wesley J. is the most prolific “scorer” in the school’s history. Mukharrier? From Ripon Yesterday - typical of meet after meet for the last few years. I saw him a few times last year. He’s a heck of an athlete! Just saw that the Girls 800 was won in 2:16 by Franklin junior Clare Pitcher. She was third at State last year in 2:13.